Back in the day, factory workers at the Chicago-based Republic Windows and Doors were simply told what to do. That wasn’t unusual. Workers might have seen ways to improve the production process, but at Republic their supervisor wasn’t interested, said former employee Armando Robles. 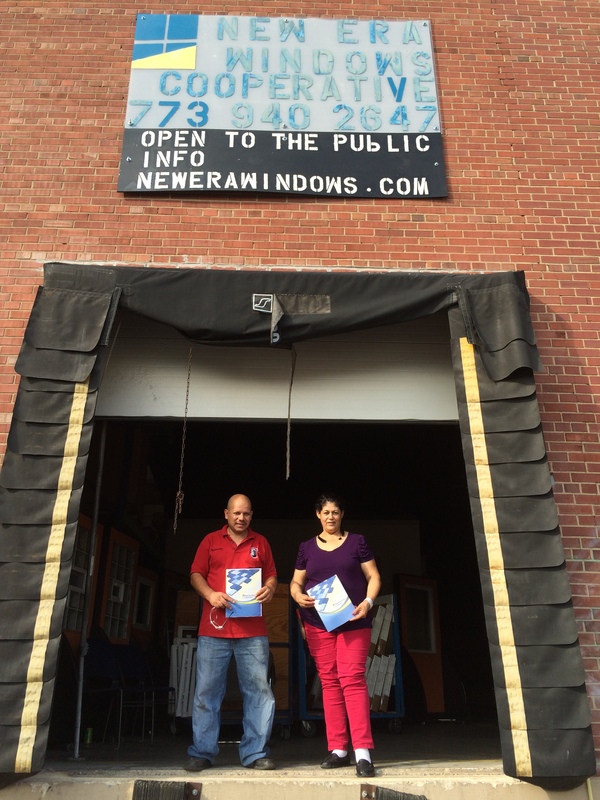 Armando Robles and Beatriz Gurrola, worker-owners of New Era Windows and Doors Cooperative. “Whatever the bosses want, we do it. We’d say, ‘Look, this is a better way,’ and they say, ‘No, we say you have to do it this way.’ Even when they make a mistake, they just continue,” Robles explained. Things are very different today. Employees of what is now called New Era Windows and Doors are also the owners. And their ideas matter. Any of them can propose improvements, and if they can convince a majority of their co-workers, things can change quickly. 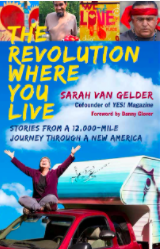 It was a long journey to becoming a worker cooperative, and it was not a journey anyone had planned. In 2008, Republic’s owners closed the factory and laid off the work force without the required 60-days notice. Workers occupied the factory and refused to leave the premises until they were paid what they were owed. The story went nationwide. Pressure from the union, area activists, and even President Obama led to a victory. The workers were paid, and instead of shutting down, the factory was sold to California-based Serious Materials. The workers kept their jobs, though the experience radicalized them. Some visited Argentina where they learned that other workers facing the same situation had occupied their factories and eventually became worker-owners. So Robles and his co-workers were prepared when, three years later, Serious Materials announced they would shut down and liquidate the factory. Once again, the workers occupied. With a nationwide petition drive, support from United Electrical Workers, financing from The Working World (an organization that helps establish worker cooperatives), support from the local Occupy movement, and the memory of the previous occupation still fresh in the minds of the Chicago power elite, the protest turned into a buyout. Sales are modest, but growing. Last year the company sold about a half million dollars worth of windows. This year, they anticipate the number will be significantly higher. There are 23 worker-owners, and two staff members who Robles hopes will opt to become worker-owners. His vision is for New Era to help spawn other cooperatives. Instead of expanding by hiring drivers, for example, he’d like to see the company help start a cooperative of drivers. How is this company staying alive when other owners have failed? The worker-owners made tough decisions about what equipment they could get rid of to save money. And they did a lot of sales via word of mouth. “The good thing is we don’t have the CEO making millions of dollars,” Robles said, “so we have the ability to compete with the industry.” Also, they don’t have to generate big profits to keep investors happy; they just have to make enough to pay expenses and pay back their debt. This business model is based on “enough.” Enough pay and benefits to live with dignity. Enough of the machinery that is necessary, but not the sort that is too expensive. Opportunities for employee-owners to draw on their full capacities, not to be relegated to repetitive work while a few make all the decisions and much of the money. Their more equitable pay structure creates opportunities for more people to have enough to live and thrive; instead of keeping some at the edge of poverty while others prosper. This is what local power looks like: companies like New Era Windows and Doors creating the stability that comes with locally rooted employment, insulated from the speculative finance that, in the case of publicly traded companies, requires many jobs be moved to low-wage regions. These worker-owners focus on values, including the possibility for others to also be worker-owners, and the importance of producing ecologically smart products. The company prides itself on selling energy-efficient windows and doors, and customizing them to the climate and location of the client. If this and other locally rooted companies can survive government policies that favor big corporations over local business, they could help lay the foundation for an inclusive and sustainable rebirth of our society.